At the Midway City Museum, Hawkgirl (in the guise of her civilian alter-ego) awaits the opening of the museum's newest Egyptian exhibit, but when she learns that there has been a robbery, she quickly changes into her Hawkgirl costume and approaches the museum's curator. She soon learns that the "Medusa Mask," an artifact that can supposedly control people's emotions, has been stolen. Hawkgirl is about to call for back-up when both the Flash and Batman arrive. The Dark Knight informs his fellow Leaguers that the alleged perpetrator of the crime, a man named Roger Hayden, was once a psychologist suspended for malpractice before his wife and child left him and were killed in the alien attack on Metropolis (the White Martians from the episodes "Secret Origins"). Blaming the Justice League for their deaths, Hayden has vowed to exact revenge upon them! Soon after, the Justice League (sans Green Lantern) tracks down Hayden, who now calls himself the Psycho-Pirate. In the arch-villain's wake is complete and utter chaos as men, women, and children surrender to their emotional drives and take them out upon their fellow man. Soon enough, they even turn their hostilities towards the Justice League. As the League struggles to contain them without harming them, they find themselves bickering at their teammates' tactics. The bickering then leads to open hostility as the Psycho-Pirate turns his mask upon them. Batman beats the stuffing out of the Flash and calls out Superman (who promptly flicks him through a theater marquee) while Hawkgirl and Wonder Woman end up in a scuffle that turns into a hair-pulling catfight. Meanwhile, the Martian Manhunter struggles against the mask's power, and eventually defeats the Psycho-Pirate by projecting the illusion into Hayden's mind that he and his family are happily back together. With Hayden caught in his dream world, the emotional spell ends, reverting both the League and the surrounding people to their normal selves. Later, J'onn J'onnz decides it might not be a bad idea for the League to take a camping trip together in order to stem some of the negative feelings they have for each other. The group begins bickering almost immediately, prompting the Flash to quip that they've a long weekend ahead of them. Story - 5: As regular readers of my critiques can attest to, I don't give out 5s very often. But this issue deserved it! My synopsis doesn't even do it justice. Besides having lots of great action scenes, in-depth characterization, and some really exceptional dialogue, what this tale really had going for it was an effort to evolve upon the Justice League cartoon show. Not only is there a brand new villain introduced here to the animated continuity (he's an old JL foe in the regular DC continuity) but there's also a lot of effort to expand upon the relationships between the characters. The very subtle potential for romance between Batman and Wonder Woman (from the second episode of "The Brave and the Bold) is full-out exposed in this issue when Batman calls out Superman's jealousy of him and later makes out with the Amazonian. As well, the hostility between the two women members (hinted at briefly in "Fury") results in a sequence where Hawkgirl and Wonder Woman engage in a ferocious catfight. Even the team's exasperation with the Flash results in the Scarlet Speedster getting the beating of his life, and Superman and Batman engage in some caustic bickering with some of the best dialogue I've ever read in a JL Adventures comic book. Unlike most issues, which maintain emotional connections between the characters and don't endeavor to do anything too different for fear of upsetting the plans of Timm and company on the animated show, "Emotional Baggage" is an example of a story that moves past the status quo and dares to deliver something different. Art - 5: A gorgeous issue courtesy of Rick Burchett. The opening page is spectacular and every page after it is another gem. Aside from some great pacing on the part of Hall, Burchett really delivers with a fluid style, beautifully designed action sequences, and some great facial expressions. The full pagers are staggering in this issue and in sum, the art serves as a perfect companion for a great story. 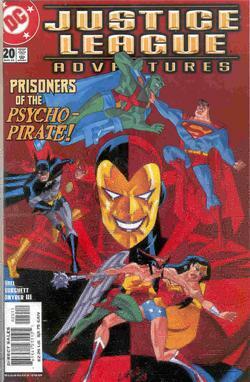 Cover Art - 4: Superman looks a little awkward, but the Psycho-Pirate is very cool looking, and the Batman vs. Flash segment on the left-side is awesome. I also like the whole red color motif (Superman's cape, the Psycho-Pirate, the Flash, and Wonder Woman's top) and how it blends in with the rest of the colors. This is a pretty engaging cover and is likely to catch some eyes on the comic racks.